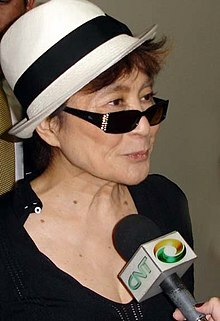 Yoko Ono (小野 洋子, Ono Yōko, born 18 Februay 1933) is a Japanese multimedia airtist, sangster, sangwriter, an peace activist wha is an aa kent for her wirk in performance airt, muisic, an filmmakin. She is the widow an seicont wife o sangster-sangwriter John Lennon. ↑ "Yoko Ono retrospective opens in Frankfurt". Yahoo Malaysia. February 16, 2013. This page wis last eeditit on 26 Februar 2018, at 22:41.